It has been pointed out that the British Empire faced a similar crisis at the dawn of the 20th century. The Royal Navy’s effort to re-balance its force structure for a new century is seen as a useful example for the U.S. in preserving global influence while maintaining an effective battle force. Essentially the British plan was to scrap nearly a century of trans-oceanic British naval policy in exchange for a smaller, more powerful and globally deployable fleet capable of both war fighting and traditional show-the-flag missions. Isolated British squadrons were concentrated into capable fleets and both outdated ships and those too slow for global combat operations were scrapped. They also significantly reduced both their Pacific and North American forces. If the U.S. should follow this pattern then it would mean re-balancing a significant portion of its naval forces to the Pacific and that change may involve leaving large parts of the oceans in the care of other democratic nations much as the British did in the early 1900s. The question is; if the US should follow this strategy, if they replicate the British strategy of 1900, how would this effect Canada? The answer may be found in Canada’s response to that last re-ordering of naval power. At that time the preferred choice of the British government for the protection of the empire was the maintenance of a common military system, sustained by direct financial contributions from the former colonies. In return, the Admiralty would be responsible to defend Canada's coasts. 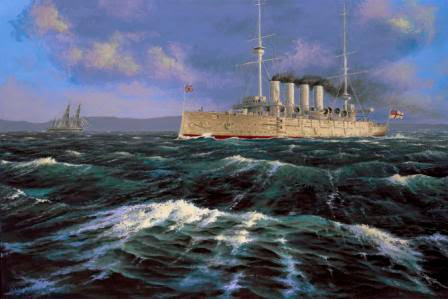 However, at the Imperial Conference of 1902, Canada rejected direct contributions to the maintenance of the British fleet, and instead pushed for the development of a local navy under the Department of Marine and Fisheries. The politics of the event were complex,(3) but in the end it led to the formation of the Royal Canadian Navy. If and when the US Navy should contract, if it should give up a trans-oceanic policy it will mean that Canada and the RCN will have to change as well. In this case Canada will still be, for the most part, within the defensive perimeter, that does not mean that we will not have new challenges in a new world order. For example if the US should essentially abandon the Atlantic and the Mediterranean it may mean that Canada, rather then re-enforcing its Pacific fleet as conventional wisdom might suggest, should build up its east coast forces to compensate for the loss of US influence. Op Caribbe (4) may well be the future, not a side show. If our force structure and deployment undergoes revision then change will be required. That change should be based on a clear strategy and the platforms, weapons and systems we procure must be designed to fit this strategy. The operational and tactical employment of these platforms should be determined by their design features and how they best support our strategy. Needless to say those platforms and systems may not be the ones we have now, or the ones we are planning on. There were differences and a lively debate over the formation of the Canadian navy and it is interesting to note that some of those political differences find there echoes to this day in the contemporary debate over the place of the armed forces in Canada. At the time there were two options, the establishment of the Canadian Navy, or continued financial support of the one in Britain. In the end parliament decided that '”The House will cordially approve of any necessary expenditure designed to promote the speedy organization of a Canadian naval service”. Not everyone agreed with this position. Henri Bourassa opposed plans for a Canadian Navy. He believed that conscription would soon follow. His supporters also believed that the cruisers proposed were more than Canada needed for fisheries and sovereignty protection, but were sufficient to attract the attention of other navies. It was also believed that Canadian squadrons, paid by and for Canada, put under the command of the Admiralty in times of war, meant an automatic involvement on every imperial war. This would put Canada in danger of being drawn into distant conflicts. On the other hand the Conservative opposition of the day believed that the Liberals were insufficiently loyal to the empire. They did not believe that the proposal was not enough to secure Canada's coasts or help Britain in its current arms race crisis against Germany, and that the practical option was to vote money to be given to the Royal Navy for the construction of battleships for that service. Both these argument will find contemporary adherents in any debate that should arise over the reordering of the R.C.N. in response to a change in US naval policy. That does not mean that Canada should not have that debate or that the RCN should not change if the circumstance we now enjoy should change. Just as changes in the past to the policy of a naval power with which Canada found itself in allegiance led to radical changes in Canada’s defence policy so too changes in US naval policy must lead to changes in Canada’s current posture. History often takes note of what happens to empires when they contract, less is told about what happens along the borders when the legions go home. In reality it is of vital importance to those along the borders to manage their affairs well in interesting times.